Little Zombies: Pop-Up Cards: Fun for all ages! 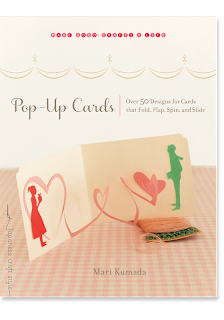 Get your paper supplies ready for September, because you are going to want to make some really great pop-up cards! Can you say creativity?! This book is for both young and old! For anyone who wants to give a homemade card to someone special. There's how-to instructions for cards for weddings, babies, Christmas, birthdays, etc. Not only are there pop-up card instructions, but also instructions for pull-tab cards and also spinning cards so it's interactive! Also included are colored templates. Just photocopy and you're on your way! Let this book spark your imagination. What kind of card will you make? Kids will LOVE this. Adults will LOVE this. Start getting creative and get some postage stamps to send your friends and family some happiness. Rated: 5 Bites and more! Check out Roost Book's free projects as well. I was given this book through netgalley.com. My review is not paid and is my own review.